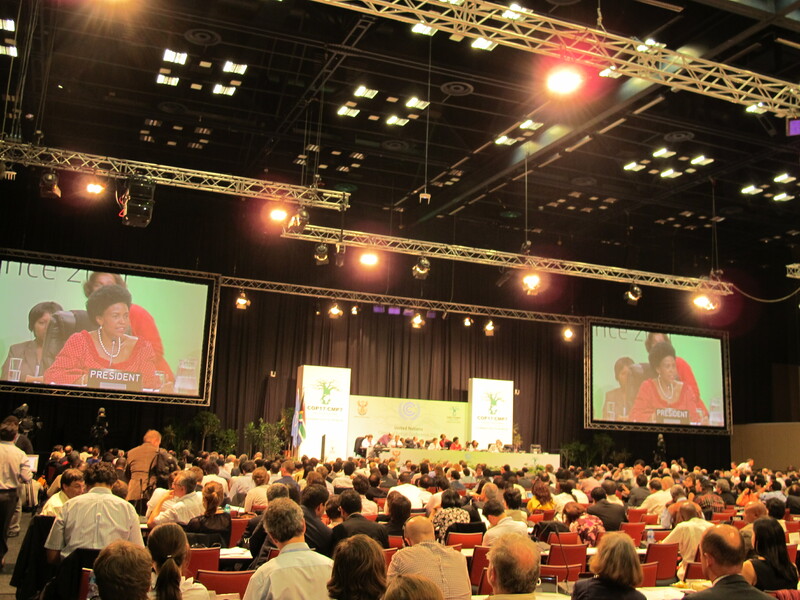 Breaking the record for the longest UN climate negotiations ever, the two-week-long international climate talks in Durban, South Africa wrapped up early yesterday morning with the world taking a small, but essential, step toward a global agreement to curb climate change. 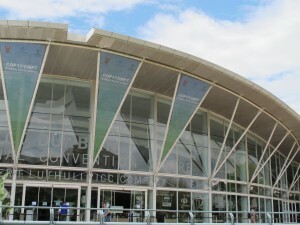 The UN climate conference went into a second day past its scheduled end at the Durban International Conference Center, but its resulting Durban Platform has produced a good first step toward a global climate agreement. It had been a long night leading up to the conclusion: enthusiastic soccer fans had taken a break from the dragging negotiations late Saturday night at the conference center’s cafe and bar, seemingly the home to the only television not tuned to the center’s closed-circuit channels, to drink local Castle beer and watch Barcelona’s 3-1 victory over Real Madrid; and by the end of the negotiations at dawn on Sunday morning, most attendees — including a number of the negotiators and ministers covering critical issues at the talks — had already left, a significant number of them to catch their flights home. But applause rang loudly from the remaining countries and non-governmental organizations in the large Baobob plenary room when the president of the conference, South African Minister of International Relations Maite Nkoana-Mashabane, wrapped up the UN climate negotiations’ 17th meeting of the Conference of Parties (COP-17) at 5 a.m. Sunday. Having run into a second day — 35 hours after its supposed 6 p.m. Friday deadline — Durban’s conference now holds the record for the UN’s longest climate negotiations. The “Durban Platform” reached by countries at COP-17 reflects the “first small but essential steps toward creating a new global agreement to curb climate change,” Jennifer Haverkamp, director of EDF’s international climate program, said in a statement. For the first time all major emitting nations, including China and India, have agreed on the need to move forward – and to do so together. The challenge is that we begin the talks from the lowest common denominator of every party’s aspirations. For this effort to be successful, countries need to be ambitious in their commitments and to refuse to use these negotiations as just another stalling tool. The president of COP-17, Minister Maite Nkoana-Mashabane, speaking at the closing session of the UN climate conference early Sunday morning. Finance: Accomplishing one of the highest priorities for this conference, countries agreed to start building infrastructure for the “Green Climate Fund,” which is dedicated to helping developing countries address and adapt to climate change. Now that the Fund has been launched, one of the highest priorities for countries is to find the public and private money to finance it. Avoiding deforestation: Countries included carbon markets as a possible funding source to pay for policies to reduce emissions from deforestation and forest degradation (REDD+). This represents a major achievement for countries, as markets are important in achieving the large-scale, sustainable funding needed to keep carbon-rich tropical forests alive. An unfortunate development in the Durban talks was the finalization of rules for measuring emissions from forests in developed countries that may allow countries to increase their forest emissions without penalty by almost half a billion tons of emissions a year. Some countries will be rewarded even if they increase emissions from forests, while others will receive massive windfalls for doing nothing. Read more about the Durban outcomes in EDF’s closing statement and Reuters’ wrap-up analysis. We will be posting our own further analysis on the Durban outcomes soon. This entry was posted in Deforestation, Durban (COP-17), Forestry, News, REDD+, UN negotiations. Bookmark the permalink. Trackbacks are closed, but you can post a comment.